In these days when anyone can set up an online shop to sell photography, I am proud to be represented by an honest-to-goodness brick & mortar gallery, Five Crows. Owned by a group of dynamic women artists – aka The Crows – the gallery is a true gem, showcasing the works of more than 150 local and regional artists, designers and artisans. Five Crows offers fine art photography, handmade jewelry, original paintings, scarves, stained glass, pottery and a slate of fascinating artist-taught classes. I’m honored to be one of the Featured Artists there this June and July, and to be in the company of the accomplished photographer Beth Hoffer. Also, a quick thanks to the kind folks at Charles River Canoe & Kayak. 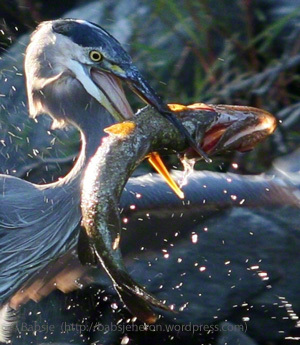 Many of the Great Blue Heron photos shown here were taken from the seat of a CRCK kayak. Maybe this should be filed under shameless self-promotion? Posted on July 11, 2017, in ardea herodias, Art, Audubon, Bird photography, DPchallenge, Fine art, Great Blue Heron, Photography, Photography challenge, Wildlife Photography and tagged Five Crows, great blue heron, postaday, TCAN. Bookmark the permalink. 2 Comments. Congratulations on being selected, Babsje. I hope many people will stop, inquire and appreciate the fruit of your patient attention.